"Definitely one of the UK's finest magicians!" Once quoted as, "One of the South Coast's finest magicians" by the Mayor of Southampton, Daniel Baker is amongst Hampshire's busiest full time professional close-up magicians, whose performance style is a quirky blend of subtle humour combined with extraordinary feats of sleight of hand magic. Close up magician Daniel has provided live entertainments at weddings, private functions and corporate events in areas covering London, Portsmouth, Brighton, Guildford, Southampton and Bournemouth. Daniel has also travelled to, and performed at, many more locations across the rest of the UK. With his unique mixture of close up magic tricks combined with his inimitable sense of humour, he always leaves the audience wanting more. 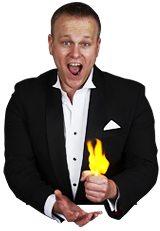 When you hire Daniel as a magician you can be sure that the your guests will be deeply involved with his act and they will experience his magic first hand as he feels this is the best way to fully appreciate the intricacies of this ever popular art form. Once the event is over you can be sure your family and guests will be left with plenty to talk about for months to come. Entertaining at weddings is by far one of Daniel’s favourite jobs as a Magician. A wedding is a happy and joyous occasion, where the guests will always have fun. Hiring a wedding magician like Daniel will add that extra touch that will keep people talking about your wedding. You can quite easily say that Magic is an art form – all artists hone there skills, and a Magician is no different. A close up magician is the epitome of this art, performing complex and amazing miracles often only inches away from the audience with amazing skill. It is not just the technical side of being a close up magician that thrills Daniel, but also the performance side of this art form. To be an entertainer, you have to be entertaining and Daniel prides himself on not only his technical ability, but his ability to entertain well. Copyright © MMXIII - CloseUp Magician Daniel Baker. All rights reserved.